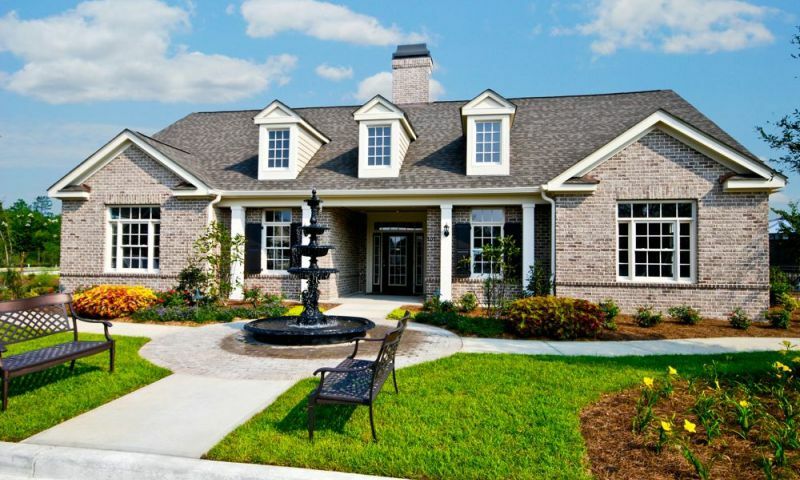 The Fairways at Savannah Quarters is a thoughtfully planned country club neighborhood within a master-planned community with true Southern charm in Pooler, Georgia. While residents of all ages are welcome, active adults and retirees are attracted to the fine lifestyle and amenities of this gated community. The Fairways at Savannah Quarters is positioned on the Greg Norman Signature Golf Course where everyone enjoys scenic surroundings and fine landscaping. Homebuyers can select from beautiful low-maintenance single family and attached homes. The 3,000 square-foot clubhouse serves as the social centerpiece with a welcoming fireplace. It has a multi-purpose room where residents gather to play cards, board games or pool, and has a catering kitchen for easy party planning. At the exercise room, homeowners can get into shape while watching television for a more enjoyable exercise session. Outdoors, the lanai and swimming pool complex are an ideal place to relax. The Fairways at Savannah Quarters also has a gazebo that serves as a focal point for outdoor events. Residents also have access to the Savannah Quarters Country Club, which include the clubhouse, three dining rooms, conference room, wine room and a fitness center in addition to the tennis court and outdoor swimming pool. They also have access to the 18-hole Greg Norman course that features natural hazards and winds among ponds and trees. It challenges golfers of all levels for exciting play and maximum enjoyment. The Fairways at Savannah Quarters has been in development since 2008 and plans to have 80 residences. Homebuyers can choose from a variety of floor plans and home styles, such as the Cathedral or Courtyard series. Common characteristics of all residences are wood and tile floors, granite counters, crown molding, fireplaces, and rich kitchen cabinets. Attached homes within the Cathedral Series are arranged in quad formations with each unit occupying a corner. They offer 1,700 to 1,850 square feet with two or three bedrooms, two bathrooms, and an attached two-car garage. Single-family homes within the Courtyard Series offer 1,516 to 2,115 square feet of living space. Homebuyers can choose from a variety of spacious floor plans and they can customize their home with optional second-floor bonus suites. These single-family homes have two bedrooms, two bathrooms, and an attached two-and-a-half-car garage. With large windows and cathedral or tray ceilings the interiors feel open and inviting. Exterior features include closed-in garden courtyards, screened porches, and plank and brick exteriors. Residents of the Fairways at Savannah Quarters enjoy an affordable country club style with villas designed for private outdoor living and can lock-n-leave at their convenience. While golf certainly plays a large recreational part on the community calendar, friends also like getting together for cookouts, cards, tennis, happy hour events, progressive dinner parties, and board game nights. As the community grows, residents are welcome to join existing activities and bring their own ideas. Conveniently located near I-16 and Pooler Parkway, the Fairways at Savannah Quarters is only 12 minutes from historic downtown Savannah. The nearest pharmacy and grocery store are within three and five minutes respectively. Hospitals, major shopping malls, and movie theaters are within a 20-minute drive. While historic Savannah is full of culture and offers an infinite lineup of recreation and activities, Pooler does have its own Southern charm, dining and shopping. For enjoyable day trips, the nearest beach is within 25 miles and the city of Charleston, South Carolina is 90 minutes away. Frequent flyers and long distance travelers will enjoy the convenience of the Savannah International Airport, situated within a 10-minute drive from the community. Residents will enjoy living a maintenance-free lifestyle at the Fairways at Savannah Quarters in charming Pooler, Georgia. Residents of The Fairways at Savannah Quarters have access to their own private amenities. There are plenty of activities available in The Fairways at Savannah Quarters. Here is a sample of some of the clubs, activities and classes offered here. Attached homes within the Cathedral Series are arranged in quads with each unit occupying a corner. They offer 1,700 to 1,850 square feet with two or three bedrooms, two bathrooms, and an attached two-car garage. These maintenance-free homes are available on a resale-only basis. The detached homes within the Courtyard Series offer 1,516 to 2,115 square feet of living space. These single-family homes have two bedrooms, two bathrooms, and an attached two-and-a-half-car garage. Homeowbers can customize their home with optional second-floor bonus suites. The homes are great and very efficient as far as energy costs. The landscaping leaves a lot to be desired. You pay an HOA fee for The Fairways ($287) as well as a mandatory club membership at Westbrook along with a $120/quarter food minimum whether you eat at the club or not. Then, yearly, you are assessed another $1700 (2018) fee from Westbrook. It has gone up every year since we've lived at The Fairways. You end up paying around $600 a month in HOA fees. We found the fees for Westbrook are of no value but no way to exclude if you live behind the gate. I have only good things to write about the Fairways at Savannah Quarters. We love the neighborhood, our home, our clubhouse and all of the amenities that are included. I am very concerned that the review written by Catherine Thompson is totally inaccurate, it should be removed. If you allow reviews to be posted the content should be checked for accuracy. Every figure she quotes is inflated. You should remove her review immediately. Houses may not be expensive, but buyers beware! You will have to pay for the following: 287$ or more for the HOA fees for The Fairways Subdision, 300$ for the HOA fees at Savannah Quarters, and a mandatory membership for the SQ Country Club. You will have to buy for at least $260 per month in the dining room because that's what will be charged you. Almost $ 1000 per month in fees alone. No flood ins possible. Just sold my house with a 90,000 $ loss. The community is great at The Fairways. You couldn't find better neighbors. The houses are terrific and very comfortable. However, it is NOT for those who are living on a fixed retirement income as you have to pay double HOA fees and monthly country club fees. I was not informed about the double HOA fees ($1.500 to Savannah Quarters per year + $170 to the Fairways every month). While the" maintenance free" fees to The Fairways are reasonable and justified, the $1.500 annual fees to Savannah Quarters is not normal at all. I have been told that these fees are paid just for the gate to the Fairways community, but that is just not possible. The folks at The Fairways are paying HOA fees for the +million dollar homes closer to the country club. I enjoy the country club but do not believe it is fair to have a minimum food requirement per household (about $120 every quarter whether you ever have a meal at the country club or not).The swimming pool at the country club is super so why have another one at The Fairways? Beware of all these extra expenses which seem to go up a lot every year. After an exhausting search for a new home we finally bought here last year. It was a wonderful experience and we are very pleased with our new home. The quality is top-notch and the building experience went smoothly. We love how quiet and private the community is. The clubhouse is very nice and has everything we wanted. It's not huge but it is beautiful and very well maintained and clean. The country club access is a major perk of living here. The golf course is great and the clubhouse there is amazing too. 55places.com is not affiliated with the developer(s) or homeowners association of The Fairways at Savannah Quarters. The information you submit is distributed to a 55places.com Partner Agent, who is a licensed real estate agent. The information regarding The Fairways at Savannah Quarters has not been verified or approved by the developer or homeowners association. Please verify all information prior to purchasing. 55places.com is not responsible for any errors regarding the information displayed on this website.